Goya Studios provides flexible and expandable Hollywood sound stage options, complete with private parking, VIP lounges, green rooms, production offices, kitchens, private restrooms, and more. WHY USE A HOLLYWOOD SOUND STAGE? A Hollywood sound stage is a soundproofed building or room that’s used to record film, television productions and music videos. Our Hollywood sound stages are ideal for anyone who’s shooting a scene that contains dialogue that they’d like to be recorded at the same time as the visuals. Common uses for studio sound stages include television shows, films, music videos and commercials. We always recommend visiting the Hollywood sound stage that you’re considering renting before you commit to using the space. This will allow you to check that it meets your needs in terms of size, layout and accessibility. However, when inspecting a sound stage, keep an ear out to see how good the sound proofing is. Grip and lighting services and equipment are also available as are kitchens with plenty of space to set up craft services. At Goya Studios, our Hollywood sound stage (Stage A) features a diversified layout with a fully-equipped staging area that’s attached to private dressing rooms and private production offices. Here, you’ll be able to take full control of your production while having ample space for you and your crew. 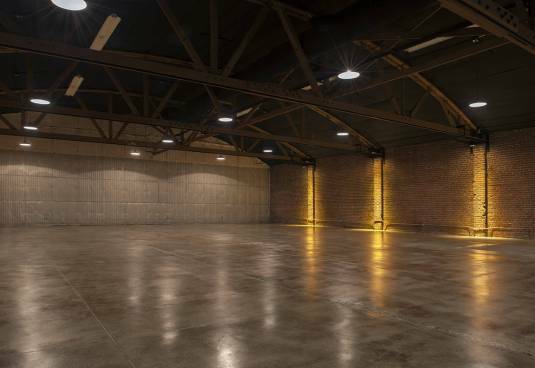 3 Stages with diversified layouts, fully equipped with staging areas attached to the set including private dressing rooms, private production offices, and kitchen available for to support craft services. Goya Studios offers complete sound and lighting control, high ceilings, as well as grip and lighting services/equipment available onsite. Ask us about our custom paint options for chroma green, chroma blue or any other custom colors desired. WHEN SHOULD I USE A HOLLYWOOD GREEN SCREEN STUDIO? Our Hollywood sound stage and green screen studio is ideal for photographers, film, television and music video producers who want to create a ‘virtual’ set that enables the use of backgrounds and/or special effects that would otherwise be impossible, impractical or too costly to create. Common uses for a Hollywood green screen studio include filming YouTube videos, infomercials, news broadcasts, music videos and parts of feature films. Here at Goya Studios, our Hollywood green screen studio space has been professionally designed, painted and lit to create a versatile yet reliable area to meet all your green screen needs. As well as having access to our shooting space, you’ll also be able to make sole use of private production offices, dressing rooms, hair and makeup rooms and a wardrobe room. To make studio life easy for you and your team, there’s also a full kitchen, restroom facilities, free wireless internet and onsite parking. A professional Hollywood sound stage and green screen studio is more than a room with any old green paint slapped on the walls! 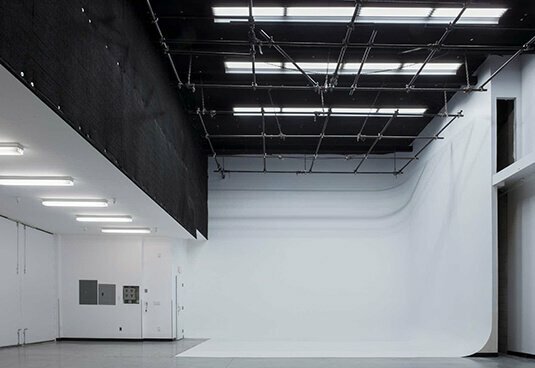 Firstly, a properly constructed Hollywood green screen studio should feature cyclorama walls that curve at each corner instead of meeting at 90 degrees. This allows your subjects to be evenly lit for the best results in post-production. During your studio scout, ask for the lights to be switched on so you can inspect the green wall surfaces to identify any abnormalities that may cause shadows or uneven color. Secondly, ask about the quality of the green paint used. All professional green screen studios should use proper chroma green paint that’s designed to bounce light correctly without creating unevenly colored hot spots. This helps to avoid problems like polluted skin tones and dark subject edges which will make your final image look like it’s been cut and pasted onto a fake background. Thirdly, look for a green screen studio that has 2 walls and plenty of space around the talent area itself. This will allow you to shoot from multiple angles at multiple distances until you’ve captured the perfect image. Lighting and other equipment is available for rent if required. A white cyc studio is a large room or space that features a white colored, curved, walled background that’s designed to look like it doesn’t have a beginning or an end. It’s sometimes referred to as an infinity background and when constructed properly, it’s almost impossible to see where the floor ends and the wall begins. WHEN SHOULD I USE A WHITE CYC STUDIO? Our white cyc studio should be used in any sort of film, television or photography application where you’d like a plain, professional and well-lit background to minimize shadows and place sole focus on your subjects. Common uses for white cyc studios include music videos, car commercials and product photography. At Goya Studios, our white cyc studio in Stage B and Stage C features a professionally designed, 2 wall cyc with 20 feet to the grid and 1200 amps of house power. It’s the perfect intimate and private environment for photo and film shoots and still offers plenty of support space. When working on Stage B, you’ll have access to 2200 square feet of shooting space and 1550 square feet of supporting space. The 2 walled white cyc screen with high ceilings will let you shoot a wide variety of angels to create the professional, polished look you’re after. A quality white cyc studio will be carefully laid out so that it can be lit to create that ‘white void’ environment without unsightly shadows, seams or shot restrictions. When looking for the best white cyc studio to shoot your next session, look for a curved wall that bounces the light around so that no shadows fall on the recording space. This is also what will help to reflect light back underneath your subjects so that shadows don’t fall underneath them either. Also check that the cyc wall is free from damage including scrapes, smudges and dirt. If there are any imperfections, these should be painted over before shooting to avoid a less than optimal result. Also, be aware of the limitations that shooting on a single walled white cyc studio presents. When working with one wall, every shot must be taken from a head on position, making it impossible to get all the angels you’d like. If variety is important to you, opt for a white cyc studio with two walls joined by an arced corner and a high ceiling. This will give you much more flexibility in terms of camera angels and movements as well as creating a better environment for bouncing light around. Included in the rental of our white cyc studio is also your own private production office and conference room, celebrity green room, hair and makeup room and wardrobe room. A photography studio rental is any type of dedicated space that’s set up to house photoshoots in a controlled environment. This may include studio stage space for setting up particular scene or a green or white cyc studio for shooting on a plain background that can be edited post-production. If you’re a professional or amateur producer or photographer who’s looking for the best studio space to bring your shoot to life, you’ll find everything you need here at Goya Studios. With a wide range of studio space to suit all your needs, plus all the extras including private parking, free Wi-Fi, production offices, kitchens and event spaces, we’re here to make your shoot comfortable and convenient. For up-to date information about the availability of our studio spaces, or to book, contact us today! DO I NEED A HOLLYWOOD PHOTOGRAPHY STUDIO RENTAL? Our Hollywood photography studios are ideal for both professional and amateur photographers who want a controlled environment in which to shoot practically any type of photographic application. Common uses for our photography studio rentals include fashion shoots, professional business headshots and product photography. If you’re looking for a Hollywood studio space, green screen or white cyc studio in Hollywood to conduct any type of shoot, large or small, we’d love to accommodate you. When working in any of our premium photography studio rentals, you’ll have access to ample support space including your own production office, green room, hair and makeup room and wardrobe room. When it comes to finding the perfect Hollywood photography studio rental, you need plenty of space and all the right amenities to make getting the perfect shot as quick and easy as possible. Look for a location that offers you the right choice of studio types to shoot all the components your session requires. You might want the space to create your own set and then be able to shoot some images in a green screen or white cyc studio. Having all these facilities in the one location will drastically reduce your overall time and cost. It’s also important that your chosen studio has plenty of space and height for you to capture your subjects without being restricted by single walls or low ceiling heights. If you’re not quite sure how much space you require, it’s generally a good idea to opt for more as this will give you greater flexibility. Finally, whether you’re using your own lighting or renting it from the studio, look for a set-up that allows for lighting to bounce around smoothly and evenly without casting significant shadows. Each studio also features a kitchen and restrooms for your convenience. We can even help with equipment hire if required..